The average blood pressure of an adult is around 120/70mmHg. The 120 ‘systolic’ figure represents the highest pressure reached. This happens just after the heart has finished contracting. The 70 ‘diastolic’ figure represents the lowest pressure, occurring just before the heart contracts again (there is no time for it to drop all the way down to zero). There is no doubt that, if the pressure is very high, say 200/120, that this is associated with a greatly increased risk of stroke, heart failure and other form of cardiovascular disease. No-one disagrees with this, not even me. There is also no argument that lowering an extremely high blood pressure can be lifesaving. But, or perhaps there are many different buts here. Things are far less straightforward when it comes to a moderately raised blood pressure. The first question to ask is. What exactly are we ‘treating’ when we lower it? A raised blood pressure is not a disease. It is not even symptom of a disease; because a raised blood pressure does not cause any symptoms unless it is extremely high. A raised blood pressure is simply a sign, or a measurement. What is it a sign of? It is a sign that your heart is pumping so hard that the blood pressure is raised above the ‘normal’ level. Why would the heart pump too hard? It is statement of the obvious to say that it cannot just happen for no reason at all. In some cases, an underlying cause can be found. If you have a narrow renal (kidney) artery, for example, this reduces blood supply to the kidney. The kidney therefore believes that the blood pressure must be too low, and it releases hormones designed to raise the blood pressure. Cause and effect. In a case like this, you can do an operation to widen the renal artery, the blood flow to the kidney increases, and the blood pressure normalises. In around five per cent of cases of high blood pressure a cause, such a renal artery stenosis, can be found. In the other ninety five per cent there is no obvious reason. At which point, something very strange happens. Instead of calling this ‘a raised blood pressure where no cause can be found,’ the medical profession decided to turn a clinical sign into a disease. This disease is Essential Hypertension, which literally means ‘a raised blood pressure where no cause can be found.’ But you have to admit that essential hypertension sounds rather more impressive. Once it became a de-facto disease, it can be ‘treated.’ And so it came to pass that, over time, a whole series of drugs were developed. Some reduce the blood volume, some relax the blood vessels, some block the production of hormones designed to raise blood pressure, and others prevent the heart pumping too hard. They come by names such as thiazide diuretics, beta-blockers, alpha-blockers, angiotensin converting enzyme inhibitors, angiotensinogen II inhibitors etc. etc. After statins, these are the most prescribed type of medications. Around the world, hundreds of millions of people take them each and every day. This mass pharmacological assault happened before anyone had actually established that lowering blood pressure was actually beneficial. There had been a couple of short term studies on people with very high blood pressure. These did show benefit. However, when it came to moderately raised blood pressure, there were absolutely no studies at all. Yes, you did read that right. No studies. It was not until the 1970s that anyone actually set out to answer this rather fundamental question by setting up a major study. The UK Medical Research Council (MRC) study. Recruitment started in 1973. Seven hundred thousand people were contacted, and half a million people accepted an invitation to participate. As is the way with such things, this enormous initial number was whittled down to just under eighteen thousand people who had a diastolic blood pressure between 90 – 109, and a systolic pressure below 200. The eagerly awaited results were released in 1985. I remember the year well, as I was at a cardiovascular conference at the time. Everyone was convinced that that there would be major benefits. The total difference in deaths was seven. The absolute percentage difference in deaths was 0.06% over five years. There was no difference in the death rate from heart disease. I remember thinking at the time. ‘Blimey that should throw the cat amongst the pigeons. We are going to have to re-think this area.’ How wrong could one man be? Because the result of the MRC study was that absolutely nothing changed. There was no re-think, no fundamental review, nothing. ‘Men occasionally stumble over the truth, but most of them pick themselves up and hurry off as if nothing ever happened.’ Sir Winston Churchill. Actually, it is not entirely true to say that nothing happened. Within the world of anti-hypertensive therapy a subtle, but critically important, change did take place. Whilst there was no benefit on heart disease, or life expectancy, there was a small, but statistically significant, effect on stroke. One stroke delayed for around nine hundred years of treatment. Nowadays, when people report on blood pressure lowering, the discussion is almost entirely focussed on cardiovascular mortality (which basically means stroke). In a parallel move, researchers started to move away from outcome data e.g. death from stroke and heart disease, and began to use a mathematical model (the log-linear model) to define the success of lowering blood pressure3. Once you decide that the lower you get the blood pressure the better this is, you no longer need measure death from heart disease and stroke and suchlike. You just measure the blood pressure reduction, feed these data into the log-linear model, then you can establish the clinical benefit you must have had. The effect of their analysis was, as you may expect, a deafening silence. This was despite the fact that these researchers had just proved that everything that everybody believed about lowering blood pressure was wrong. The log linear model rules, lowering blood pressure is beneficial. During that twelve year period between these two studies, the thresholds for ‘treating’ blood pressure became lower and lower. For diabetics, essential hypertension has now fallen to a systolic of 115mmHg. This definition was created from combined end-point cardiovascular data, and the log-linear model. The one that has been proved ‘shockingly’ to be false. I wasn’t that shocked. In fact, only one thing shocks me. It is fact that you cannot get anyone to change their minds in this area. A raised blood pressure is bad, and must be lowered, full stop. Whilst I would agree that a raised blood pressure is ‘bad’ in that it is associated with and increased risk of premature death. I cannot find evidence that lowering the blood pressure does any good, no matter what the level. The simple fact is that when blood pressure is raised, it is raised for a reason. The reason is an underlying ‘disease’. And just because you cannot find it, does not mean that it doesn’t’ exist. Lowering the blood pressure will certainly get rid of an annoyingly high measurement, but it cannot (unless by complete coincidence), have any impact on the underlying disease…… the thing causing you to die. So, unless it is startlingly high, what good can lowering blood pressure actually do? This entry was posted in Dr Malcolm Kendrick and tagged cardiovascular disease, cholesterol, doctor, dr. malcolm mckendrick, Essential Hypertension, heart failure, high blood pressure, MRC, scottish, statin nation, statins, stroke, systolic, the great cholesterol con, treament on April 2, 2012 by Dr. Malcolm Kendrick. I’ve read your book, driven (with book) about 150 miles from SK7 to hear you speak, but failed to shake your hand and/or get the book signed because you left early. You did have good reason. I’m bitten and infected. I’ve read them all, Kendrick, Colpo, Ravnskov, Graveline, Briffa, Masterjohn, Sinatra, Taubes, Groves, and the most concise and assured of all, Lane. Each have their merits and each fulfils a place in a bigger picture. Your own conclusions intrigue me because they have potential, in my view, to tie in with another of my interests. It’s great you have created a web presence – hey, and not before time! – and I hope you quickly develop good hit rates and an interested following. Promotion is key. An email alert service would be helpful so that you can advise followers by email when you add new posts. And I could envisage people may see appeal in engaging with you privately, sometimes, instead of by way of open comments. You present an assured case that may well provoke professionals to reconsider if their faithful stance is warranted, in the line of treatment of hypertension, and your argument is a counter to the overblown levels of trust in what the numbers actually mean or what they indicate. It’s clear enough for muppets (or ‘moppets’ if lawyers prefer) like me too. Does blood pressure carry with it some instructive meaning? Hypertension is no doubt a ‘symptom’ as opposed to the nuts and bolts that are seated deep close to cause and causality. But we can all agree likelihood of death doesn’t reduce with age, and is it not fair to say for that hypertension (high blood pressure) to reduce without intervention and use of drugs is, well, bucking the trend. Many a GP would insist hypertension requires repeat prescriptions for the rest of natural life. Sinatras’ text does not supply hard data in re. blood pressure and Earthing but there are a couple of illuminating case studies. But chapter 11 includes some darkfield shots (images) of blood samples before and after 40 minutes of Earthing. The shots before show extensive coupling and aggregation of cells (coagulation or the like) suggestive of high viscosity. The shots taken after show almost no coupling of cells. Cells after would look to be more mobile, and the medium (blood) would look to be more fluid. These images were from a house party with 12 willing volunteers at Sinatra’s home. I think the group were astonished. So Sinatra tried to repeat the tests in a more formal setting. The text ventures into discussion of this along with reports of an astounding rise in something called ‘zeta potential’. Zeta potential measures the level of charge (in mV) sitting on the surface of a blood cell. As with blood pressure there are ranges considered to be functional and healthy. In trials involving 2 hours of Earthing, achieved through attachment of sticky electrodes to hands and feet, there was an average improvement of 270%! (no typo). Samples rose from below the lower concern to just under the upper value delineating the healthy range. And this is important because? Einen augenblick, bitte! (One moment, please.) Why does it take bricks and mortar to build a wall? What does the mortar do? Wrong! It keeps the bricks apart. It’s important because the negative charge (zeta potential) sitting on the surface of blood cells is there to keep them apart. Cells naturally find security in numbers, a bit like sheep, or members of the medical profession (ys excluded naturally!). If each has the correct level of negative charge (zeta potential) it keeps them apart. Crucially I’m not qualified to know or say, but I figure the response to injury case could involve a localised reduction of zeta potential of cells so clotting, stemming, and closure of a wound can be effected. What might counter zeta potential or signal the need to reduce it. The presence of positively charged free radicals, perhaps? And if a lot of free radicals persist after the emergency call and the need to signal the response to injury what then? Zeta potential would remain low, blood would be viscous and the heart would have to pump harder – resulting in high BP? So does raised blood pressure indicate, perhaps, chronic inflammation caused by chronic persistence of free radicals generated by stress, poor habits, exposure to toxins or foods our kind are not wholly adapted to? In turn are the deleterious effects of persistent free radicals and oxidative stress further compounded by a shortage of anti-oxidants and a shortage supply of ‘free electrons’ as the ‘Earthing theory would have it? Has ‘free electron deficiency disorder/dysfunction’ become the norm in the ‘disconnected’ western world? Given the range and diversity of conditions that Earthing positively impacts upon, as reported in the book, that could be the case. If the mind first contemplates conditions that prevailed 3.9 billion years ago in the primordial soup (probably in proximity to a deep ocean vent), and looks to the example set by all other species save for our own in the developed world, this rather simple and radical ‘Earthing’ idea does not seem so outlandish that the mind dismisses it out of hand. Odd sounding at first the hpothesis of Ober, Sinatra, and Zucker does slowly begin to ‘feel right’. Those that put it to the test report wide ranging instances of feeling ‘better’. Good-on-yer, Dr Kendrick. Scepticism is the antidote to ill-conceived consensus and stands comparison with zeta potential, Yay! .. .. In the medical profession the general lack of dissent and scepticism is as low and as damaging as low zeta potential could be in the blood. Let’s champion scepticism, I say. Earthing is new and not widely known about in the medical profession so, please, do not consider these words to be prescriptive advice. 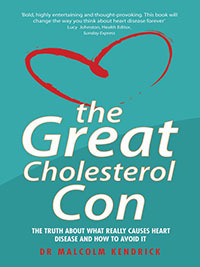 Read into arguments promoted by sceptics, like ‘The Great Cholesterol Con’ and make up your own minds folks. As always this is thought provoking and for those like myself, worrying. Asking my G.P. to read ‘the great cholestorol con’ met with a dismissive comment. I haven’t shown it to my cardiology consultant – yet. Very good article. I have long-wanted to find someone in medicine who knew a thing or two about research methods, hadn’t been bought-off by ‘big pharma’, and was prepared to be an ‘outsider’. I think I may have found him. Your article confirms my own crude research into the literature on statins and blood pressure and NCDs, which I did after being told by my GP that I had slightly elevated blood pressure (142/80) and that I had to start taking statins. I will be sure to look at what you (must) have to say about a lot of the other conventional, pharma-driven aetiological conventional wisdom too. I feel that I am at the crossroads you discuss in the article/blog. I had a blood pressure reading of 160-180 over 90 ish. I’m on a daily 8mg pill for the rest of my life according to my GP. My issue is that I feel this treats the effect rather he the cause.the GP has me filed away as sorted. I don’t feel I am. He it hunks I should be taking statin too as does the practice nurse etc. I’ll try again to try to get him to consider another approach. I doubt he’ll be keen. I’ll be buying your new book on how to spot scientists who may have ulterior motives. Since my 92 year-old mother has been put on blood pressure medication (about a year ago now) she has developed an irritating increase of phelgm in her throat and fainted twice, most likely due to hypotension, we as a family have concluded. She had no symptoms of any underlying disease but has smoked all her life and, fortunately, it doesn’t seem to have had any ill-effects (we joke that she has preserved herself, rather like a kipper!) She is mentally alert and lives on her own, taking herself off into town on the bus a couple of times a week. She always has her blood pressure checked at the GP surgery – an alien environment for her, as she has hardly ever had to go to the doctor – so I’m pretty sure the readings there (which weren’t particularly high for her age) were probably elevated due to ‘white coat syndrome’. When you say look more deeply for causes of high blood pressure where would you start. I am on three blood pressure meds and would desperately like to come off at least one but is a bit difficult as I suffer from white coat syndrome and it is difficult to get an accurate reading. Patty – No problems re ‘White Coat’. Go buy your own BP cuff, upper arm cuff (the wrist ones are not accurate). Boots do a very good one. IF uncertain, ask a member of staff for advice. (Mine is the IntelliSense, Boots best). Have had about 4.5yrs now.. Has a memory, and am very pleased with it. Take your pressure three times per day – try to make around the same time: morning, midday’ish/early afternoon, and evening. Take the left arm three times, and the right arm three times – and wait a full minute between each reading – six in total. At the end of the day, you’ll have 18 readings. Next step. Add the first readings for the L. arm together, then take an average. Next do the R. arm. Add together, take the average. Not yet finished! You’ll end with three readings for the L and three for the R. Guess…Now add those together and take an average. Left with two readings. Done. But, got to do for a week – keep records. Yep. I know, a bit of a long haul – but you get accurate readings. Right in the comfort of yr own home. Dear Dr Kendrick, Help! My husband won’t go near the doctor. His blood pressure has been slightly raised for 10 years to our knowledge. 145/95 He knows that if he reports to the surgery, his GP will glower at him and demand that he starts medication. He’ll probabaly fall victim to the threat of statins too. We have tried all sorts of life style changes but nothing seems to have made much difference. In every way he keeps very healthy. What do we do. Try l-arginine supplementation. This can lower BP by increasing NO synthesis in the endothelium. The authors won the 1998 Nobel prize for medicine. You can’t go wrong with l’arginine. AAKG is the best form : Alpha Arginine KetoGlutamanate. It’s a sad state of affairs that so very few people have heard of l’arginine, let alone any doctors ! Congrats Dr Kendrick. Coming very late to the party, but I will point out that l-arginine can trigger HSV flareups. This shouldn’t prevent anyone from using it, but be aware. I add l-lysine and extra zinc to the l-arginine supplement that I take, and this pushes my flareups back to a bi-annual occurance (as it was before I started the l-arginine) instead of the every 3 to 6 month frequency I saw without the extra zinc and l-lysine. Hi, how much should you take. I cannot follow this reasoning. A first after reading many of your excellent posts. Thank you for this article. I fear that the Pharm. industry has entirely too much influence on our doctors’ decisions. We all need to continue to read articles like this and become in some measure our own doctor. Or at least search for doctors who will think outside the mainstream thinking occasionally. Pingback: What is truly high blood pressure for a male age 46 in good health? be done about and it may (note MAY, not DEFINITELY) have been avoidable. I’ve found this article particulary interesting as I’ve just been put on a fourth BP daily pill. There seem to be parallels between what we told about hypertension and what we’ve been told about a high fat diet. of saturated fats. I’ve lost 2.5 stones in weight and many ailmants such as reflux have disappeared. To Hannah Foster, I recommend that she read Why We Get Fat and what to do about it by Gary Taubes. I came across this today and thought readers of this blog would find it interesting. The link I left July 2013 is no longer working but a newer version of the paper is available here. What do you think about this metaanalyis? Mulrow CD, Lau J, Cornell J, Brand M. Pharmacotherapy for hypertension in the elderly. Cochrane Database of Systematic Reviews 1998, Issue 2. Art No. : CD000028. DOI: 10.1002/14651858.CD000028. They found reduced total mortality on antihypertensive treatment. I shall get round to it. I also found reduced overall mortality on meta-analysis, but the difference was so vanishingly small that I wouldn’t bother to take meds myself. Pretty general question but is it likely that high BP would cause tinnitus I had my BP taken at my GP and it was 140/95 and my GP said it could only be the HBP and nothing else despite the fact the tinnitus came on AFTER my first HBP measurement. I have undertaken some lifestyle changes and 6 weeks in my systolic has definitely dropped to around 134 but my diastolic remains at around 93. My tinnitus is more annoying after this time but I’m determined not to go on meds and continue to reduce my BP naturally. Re: If you simply treat the symptoms and leave the causal factor in place it does no good at all. I’m sure this is true, but what are these causal factors? From what I’ve read, hypertension is mysterious. Causes are unknown, hence the web is full of advice on treating the symptoms that are treated, either with meds or with natural remedies, or come combination, exercise, etc. No one, including this article, mentions possible causes. Improving Magnesium levels may lower blood pressure. Correction: causes other than the renal artery, mentioned here. In most instances the reason for high blood pressure is unknown, but one that is known and can be treated, is when the artery to the kidney narrows so the kidney sends out hormones to increase the blood flow. Hence the blood pressure rises. The instance of narrowing arteries is a fairly small percentage of high blood pressure cases. Most often the reasons individuals have high blood pressure are unknown although anyone with an ounce of common sense can probably guess some of the causes e.g. heavy drinking, smoking, stress, over weight, high salt use, bad eating habits to name just a few. Most Doctors will prescribe medication to lower blood pressure but that only hides the problem and does not explain the reason of why a person’s blood pressure is high. We need to find out what is causing the problem and in many cases we don’t need a doctor to tell us as who knows our lifestyle better than us. My Blood pressure always rises when I receive bills in the mail. I did suggest to my Electricity and gas company that they include some blood pressure lowering medication in the same envelope as the bill. Shurly we all have different thickness arteries so this is why our bolld pressures are different . Like hydrolics really . Any studies ever done on this? This is a late reply but as a runner you are an excellent patient for taking 4-6 g arginine, 400 mg of magnesium glycinate and possibly extra zinc, copper, and vitamin C. When you run, the stress on arteries and connective tissues uses a lot of arginine and magnesium. When I read NO More Heart Disease, the only thing I was missing was 4 g of argining daily. After adding this over about six months my BP dropped by 18 points to 122/72. Also concern yourself with taking >2000 IU vitamin D, 1.5 mg MK4 vitamin K2 and retinol vitamin A if you have heart disease in the family as these will clear the calcium out of your arteries. Up to the year 2000 the medical profession around the world recognised that the normal high reading of BP was for a male 100 + age and for a female 100 + age minus 10, so this would mean a male of 65 would have a normal high reading of 165/80 for a female 155/70. However since 2000 the medical profession along with the pharmacutical companies have gradually pushed this down. The only way for the majority of older people to reduce blood pressure to a much lower level is to drastically loose weight or to go on medication along with regular visits to specialists and doctors along with medication from the chemist. Also why is it people with low blood pressure still have heart attacks and strokes? Some people with age matching blood pressure 65yo 165/80 live healthy lives and in many cases outlive people with lower blood pressure who are skinny and on medication? Any doctor who is honest will admit that the systolic number is quite normal if it is 100 + your age! That’s right, if a person is 70, it is quite normal for the systolic reading to be 170. Furthermore, the numbers that are created by organizations who have a huge financial interest in them, the lower the numbers, the more people who will be prescribed medications , and more $$$$$$ those meds will generate! Does anyone really know what blood pressure is supposed to be? I read a story written by a doctor about his grandmother….her blood pressure was regularly in the 300s/100s, she lived well in to her 90s!!! Blood pressure medications actually weaken the heart, and work against your body’s response to certain situations. I think it’s ridiculous to lower it, when no one knows what causes it, and ignore the horrible side effects of the medications, which themselves can be more deadly than the “conditions” they are used to “treat”. How can everyone have the same readings when we are all so different? Just like cholesterol, I am sure in the near future that blood pressure numbers, medications and theories will go the way of the statin..down the drain! A very sensible and reassuring comment. I was put on medication for supposed hypertension. A couple of months later I passed out, an absolute first for me, and a subsequent test showed I had heart block and needed a pacemaker fitted. I feel this medication possibly contributed to me having arrhythmia. I took myself off the medication and with some life style changes and supplements feel that my BP is now under control. As a nutritionist that famous “underlying disease” is not mystery to me! I am fully aware of those underlying causes and I treat my patients for it…guess what/?!! With great results!! Never ignore “White Coat Syndrome” vis-a-vis hypertension. On a routine visit, one of my doctors said my BP was elevated and prescribed Lisinopril, for life. A year or so later the dose was doubled then subsequently raised yet again. I collapsed and ended up in A&E where it was found that, after a period of rest and several checks my “standing” BP was, if anything , on the low side. I was also given a strong hint that there was a very good practice at the end of my road! Needless to say, I transferred immediately. This year I was asked to attend a clinic run by the practice nurse since I was still logged as hypertensive, though not on medication. It was an eye-opener! First BP reading 198/95 then a little relaxed small-talk and she did another unexpected check – 170/85; we discussed a few more things then to my amazement she said “Let’s have another look at it” it was 148/84! Allowing for a bit of remaining tension it was probably the 140/80 that it had been for at least 12 years before Lisinopril “treatment”. My late husband and I had the same BP reading and the nurse used to check mine on her regular visits to him, so that’s a figure I am quite sure of. Or maybe “white coat syndrome” is simply “white-coat-person’s-technique-needs-improvement syndrome”? 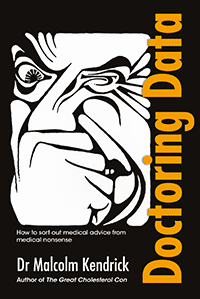 Just noticed this Kay; I don’t think this is the case because I have no feelings of apprehension re doctors, so it must be something very deep-seated that would have little or nothing to do with the practitioner’s technique. I have used a cuff at home and the same thing happens. Fantastic article! Please write more! So, why bother doing surgery in the case of renal artery blockage? Perhaps elevated BP is normal and healthy for that person. Also, you say “There is also no argument that lowering an extremely high blood pressure can be lifesaving.” What numbers are you talking about here? Above 160 systolic, probably. I think. The whole area is a bloody minefield. If a guy has a BP of 480/350 and isn’t dead, or feel sick, but is a healthy weightlifter, then that supports your statements “I cannot find evidence that lowering the blood pressure does any good, no matter what the level.” and “There is also no argument that lowering an extremely high blood pressure can be lifesaving.” Any thoughts? When you say “The whole area is a bloody minefield.” Do you mean politically? Thanks!! Thanks for posting. What about the diastolic? I see both a minefield and a great big swamp out there. “The minefield” is all the opinions about what constitutes high blood pressure and what it’s going to do to you. It’s all the statements that high blood pressure is a “silent killer,” that it’s going to damage your organs and cause a stroke — with no mention of how high the pressure must be to do these things. It’s all the vested interests calling lower and lower pressures “hypertension.” It’s the articles claiming that even at these new lower pressures some people are having strokes. It’s the regulations and treatment expectations based on these lower numbers. . . Does Malcolm really mean that lowering the blood pressure doesn’t do any good, no matter what the level (even extremely high)? Or is there some level that we should lower it (with drugs if necessary)? What would that level be? There are levels where treating is necessary. My point is mainly that it is very difficult to find the cut off point. Anyone know how can you lower blood pressure without meds and how can you come off the meds. Dont want to speak to the doctor about this because they dont really listen. If lowering blood pressure does no good, can anyone explain how it is that since being put on blood pressure lowering medication, my friend is positive she feels much better and has more energy? I have an idea she thinks I ought to be on them too, and that I need my head testing, because my blood pressure is higher than it ‘should’ be, and I have no intention of dashing off to my GP. Any views? Blood pressure medication causes adverse effects. There is no mechanism that I am aware of whereby they can make anyone feel better, other than psychological. I covered this in my book Doctoring Data. So what can you do to lower blood pressure if not meds. Sunshine, exercise, yoga, l-arginine, potassium. thank you for replying. how much l-arginine and potassium should you take. am on meds but I have stopped one about 3 weeks ago and it doesnt seem to have made any difference to my blood pressure. I am going to try and stop the second one in a few weeks and see how I go. Thanks Dr K. I should have remembered that. I’ve lent my DD book to someone and didn’t have it around to check up. How powerful the mind is though. I’ve just finished reading Irving Kirsch’s book on antidepressant drugs: The Emperor’s New Drugs, in which he proves that point very conclusively. The trouble is, you can only deal with yourself psychologically, and that’s difficult enough. If I tentatively suggest to someone that the blood pressure medication is having a psychological effect only, I feel like an insensitive, nutcase murderer taking away a person’s crutch. Maybe not as bad as that, but I am sure people understand that feeling if they have ever tried to talk to someone about blood pressure, cholesterol etc. I do seem to have put a few people off statins though. One person, when I launched into my “don’t take statins whatever you do” routine, surprised me by telling me she had once, but ‘never again’. She ended up hardly able to walk and the pain disappeared as soon as she came off them. So, a small personal aneddote of someone I actually know has been added to my repertoire. Must get my DD book back! Dr Stephen Sinatra suggested 2 grams of l-arginine daily. According to Dr Patrick Kingsley and others, magnesium is an effective way of reducing blood pressure too. I’ve used transdermal magnesium oil which I believe may have lowered my BP. Pycnogenol is said to help as well. Ive tried the l-argine and magensium but they didnt work. have had to start taking the meds again as my blood pressure went up to 180/95. When you come of meds does your blood pressure go mad to start with. How do you find out what is causing high blood pressure. All the docs want to do is give meds. I don’t know for sure but from what I’ve read, if someone is on anti hypertensives, the body comes to rely on them to regulate blood pressure and if you come off them, our own mechanism to regulate blood pressure has been disrupted. I’m sure Dr. Kendrick would be the person to ask but perhaps the body needs time to adjust after coming off medications. I had a bad experience with Lisinopril. It took three weeks before the unpleasant effects of this drug faded after I stopped it. I am determined that I won’t take any form of medication again therefore I keep active, keep my weight under control, eat sensibly and take supplements such as l-arginine and magnesium although sometimes my BP falls too low. But I think overall my BP level is acceptable to me at least although my GP, would of course, disagree. Hi, how much and what type of magnesium do you take. How much l-arginine. So if if come of the meds my blood pressure will probably be all over the place for a few weeks. Perhaps I should try again and give it three weeks. As I mentioned earlier I’m only going by what I’ve read on various websites. There are some interesting self help books such as Dr. Stephen Sinatra’s Lower Your Blood Pressure In Eight Weeks. He helps his patients by gradually introducing supplements such as l-arginine, magnesium and others and encouraging them to adopt lifestyle and dietary changes and in some cases gradually weans them off their drugs. Another very good book I’ve read is the New Medicine by Dr. Patrick Kingsley. He also recommends the use of magnesium and relaxation techniques. He also believes that too much calcium in the form of dairy products should be avoided as he believes this can also lower blood pressure. I personally used transdermal magnesium oil. I would spray on about 250g worth and perhaps have another 200g a day in capsule form. I was taking 1g of l-arginine a day. The problem was it was working too well. My blood pressure was dropping to rapidly and I was getting the same unpleasant sensations as when I was taking the dreaded lisinopril. I have also lost over four stone in weight which certainly helped. Ideally it would be advisable to find a practioner who could work out an effective program for every individuals needs. What is the point in “artificially” lowering blood pressure if it’s only a cosmetic exercise. Thanks Karl. Ive been taking 3 grams of l-arginine. It could be I dont think its working because I am on the meds and when I come of them I should give them more time to work. I think you have done extremely well to get where you are. And yes it would be nice if you could get a practioner who could work out an effective program for every individuals needs but there isnt anyone that I can find. Thanks for the information you have supplied. I’ve looked at the previous posts and there’s a comment by wholefoodviv posted on 3rd march. She’s a nutritionist who has helped others with their BPs. She may be able to advise you. I have heard if you take 1/4 teaspon of pure sea salt in a litre of water will help with blood pressure. Not sure if this work. My dose of Rampiril has just been upped to 10mg a day. BP was around 150/100. Dr K says it is just a measurement, possibly of something else. I assumed, and I cant be alone, that raised blood pressure inflames arteries and damages organs. So am I wrong? Do I ditch the meds and say what the hell? It would be nice if the doctors would do a bit more investigation to find out why BP was high instead of medicating. Unfortunately all they want to do is give tablets. I wish I knew the answer because I would love to stop taking mine. Can the meds cause lower leg aching. I have been getting this a lot lately. We talk about hypertension – high blod pressure, but what is really going on when when we “take” the blod pressure? From my point of view, a cuff is placed on the arm. pressure it added to this cuff in order to “cut of the blod”. The pressure of the cuff (!) is shown on the display. Pressure is released until we hear a pulse. We note the number on the pressurized cuffs display as systolic pressure (High pressure by the cuff to recognize a low blod flow). We release more pressure until we cannot hear the pulse, and we note the number on the pressurized cuffs display as diastolic pressure (Less pressure by the cuff to recognize a stronger blod flow). Does this mean that we have both a high blod pressure and a high cuff pressure or am i missing some point here? In my world, a high cuff pressure reading (systolic) means LOW blod pressure, and a low cuff pressure (diastolic) means HIGH blod pressure. So, what is real? Have we got it wrong from the beginning, assuming high reading on the cuff being high blod pressure or what? Excellent debate and many ideas worth research in quest to lower blood pressure.